BRIDE.WIFE.MOM | How Do You Know When He’s Going To Pop The Question? Even guys who are a little slow on the uptake know that if they start asking you for your ring size and preferences, you’re going to realize that something is up. Which means they’ll typically talk to your friends and family members, and ask them to act as a go-between in figuring out what kind of ring you’d like best. 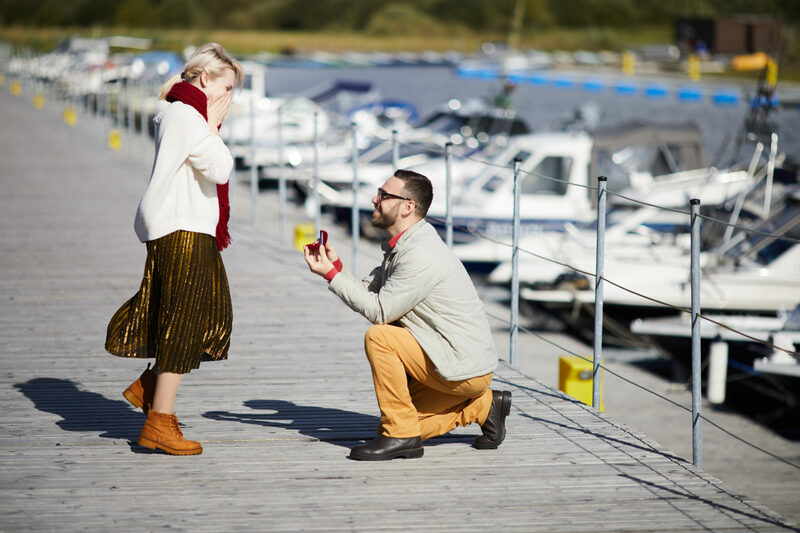 Sometimes, though, this means that friends who’ve never shown an interest in your jewelry preferences (or your engagement hopes) suddenly get all sorts of curious about what would make you say yes if he got down on one knee. There are a lot of reasons to start saving money, but if you notice a sudden change in your partner where he’s trying to be thrifty all the time, there might be an ulterior motive there. Look for guys trying not to go out to dinner so much, or who want to suddenly go on dates that are free. Movies in the park, evenings at the beach, picnics, that sort of thing. If nothing has changed about his income or bills, then chances are good he’s saving up for a significant purchase. Normally it’s a bad sign when your partner used to be okay with you browsing through his device, but now he insists on looking anything up for you on it. Most of the time we assume it means he’s been calling, or at least texting, with other girls behind your back. However, most of us use our phones as a primary shopping device these days, too. So if this sign corresponds with others, it’s likely that he doesn’t want you seeing that ads for engagement rings are popping up all over his searches, and that he’s bookmarked several styles he’s thinking about getting you. This is probably the biggest warnings sign. If you’ve been together for a while, it’s easy to get comfortable where you are. But if he starts asking probing questions about the future, such as whether you’d be willing to get joint bank accounts, make investments together, or if he’s suddenly paying attention to how much debt each of you has, then he’s not just thinking about “some day” anymore. He’s planning on how he’s going to get from where you are now, to that place where you’ve both said “I do” in front of all your friends and family. Pay attention to how he acts when you get invited to other people’s weddings. If he always seemed bored and listless while cracking jokes under his breath, but suddenly he’s commenting on music choice, venue cost, and asking you what your thoughts are about style and entree choices, that’s a change in manner you should notice. Because it probably means he’s taking notes on what he likes, what you like, and what he’ll be able to afford.